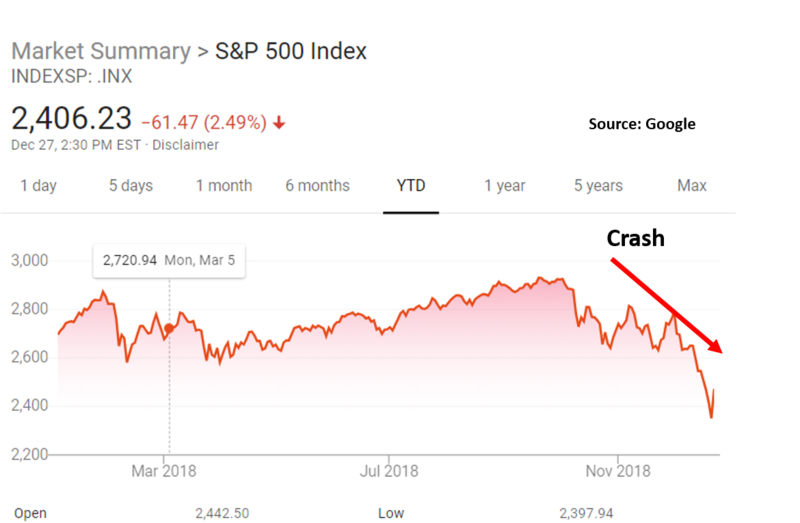 The stock market is in a panic! Last quarter of 201 8 has been one of the worst for the stock market. As a result, like many 401k account holders, I have also incurred losses in my 401k account. Fundamentally, the economic story is still positive. The current inflation rate is 2.1%, which is not that high, the unemployment rate is as low as 3.7%, and the US GDP grew at an impressive 3%+ in the third quarter of 2018. However, on the flip side, tariff war with China, the partial government shut down and tweets from our President Trump have made the investors anxious and the stock market is sliding down and entering a bear phase. The question that everyone is asking is: What changed in the last few weeks that most experts on the top business news channels such as Bloomberg, CNBC are now predicting a recession? While the news is informing the public, it is also contributing to the frenzy by making investors more anxious. The rise in Student loan debt: The student loan has been on the rise due to the high cost of education in the United States. The cost has been increasing much higher than the overall inflation rate. One way it is good that more and more students are going for a college degree but on flip side, it has increased overall student loan burden. The rise in US government debt: US debt has been rising over time due to quantitative easing and now with Trump Policy of lowering the Corporate tax rate from 35% to 21%. The reduction in Corporate tax was one of the main reasons for the improvement in corporate profitability and earning per share for the investors in 2018. Walmart and Amazon even increased the wage rate for their employees. The lower tax rate makes the corporate profitability high but contributes negatively to the fiscal deficit. Tariffs: The tariff war between China and USA is far from being over. The President announced a 90-day truce but no one knows when it started or when it is supposed to end. The demanding stance of US & uncooperative attitude of China will let this problem to linger on. Increase in the interest rate: Considering the softness of the stock market, the President, the bond market and the experts warned against the increase in interest rate. However, the Federal Reserve Board increased the rate by 25 bps or 0.25% on Dec 19, 2018. Federal Reserve Chairman Jerome Powell was put in a tough spot. Was it done to show the Fed’s independence? Was it the right move? The results were mostly negative as the stock tanked and 401k account holders lost 1-2% on the day of the announcement and continue on a declining path. The fundamental reasons why the recession is not very near? Inflation is around 2%, the Federal Reserve’s sweet spot. The marginal increase in wages has not impacted the overall inflation rate. The price at the gas stations has gone down and that will be positive for the headline inflation rate. The tariff war between China and USA. Tariff war between China and USA is far from being over. But experts believe it will resolve because both parties are hurting. China’s growth rate is slowing as their exports are hurting. USA not only needs Chinese money to keep the demand high for US treasuries but also China is an important market to export cars, planes, soybean, and meat. The unemployment rate is at a historical low. The rate of unemployment is below 4%. Although most of the job creation is in retail segments and they are not high paying jobs, it’s better than having 6-7% unemployment rates. GDP growth: As per the Federal Reserve Board, the GDP is expected to grow at 2.5% in 2019 and 2% in 2020. This suggests that the economy is slowing down from 2018 but will still be able to achieve a decent growth rate in the next two years. So what should you do and what options you have as 401k account balances are sinking? Review strategic allocation and reduce exposure to equities. Capital preservation is the key in the current environment. Review your strategic allocation. Re-balance and reduce exposure to stocks and move a certain percentage of your assets to bonds and money market funds. Within the equity market re-balance to Large Cap defensive stocks in utilities, healthcare sector. Mid-cap and small-cap stocks tend to be more volatile, hence it’s better to reduce exposure to those asset classes. Consider moving certain % of 401k assets to Treasuries, Money Market, and Inflation-Protected securities. The partial government shutdown and constant tweets from the President may further slide the market down in the next few days. Moving to less risky assets may preserve your capital. lock-in gains or prevent from incurring more losses. Are we in the bear market? Many experts are now predicting that the next recession is near. Based on some fundamentals metrics such as GDP growth and the unemployment rate, the economy is still doing ok. However, the deficit is piling up and is now 3.9% of the GDP. With rising interest rate, the cost to finance the debt is ever increasing making the situation worse. 2018 fundamentally was a good year but S&P 500 return is negative for the year. A drop of 20% or more signals a bear market. The financial & technology sectors are not doing well and utilities is the best performing sector, it also signals a bear market. The consumer sentiment has been bullish but there are some expectations that something is bad going to happen. So, keep an eye for those indicators. Passive investing and algorithm trading magnifies the impact of any stock market movement. It’s really hard for an average investor to get out in time as most of the 401k options are passive mutual funds mimicking a specific index. An average 401k investor is not only handicapped as they do not what is inside the funds but also some 401k plans don’t even have a diversified set of assets. Some of the 401k plans don’t offer Treasuries, Inflation-Protected securities or Money Market based mutual funds to de-risk their portfolio. We can assist you to tide over these difficult times. Our free app, Plootus, provides unbiased advice and assists you in choosing the right investment options from your 401k/403b plan. We don’t sell you any funds but assist you in optimizing your 401k/403b portfolio. We are on a mission to democratize financial planning and make it available to everyone! Plootus (available on Apple and Android app stores) will select the best performers to suit your retirement needs. It will analyze your 401k investment options and help you to decide how much to invest in equity or bond funds available to you. Our algorithm first estimates how much money you will need for your retirement period. That’s it from our end. Happy Holidays. Enjoy your time with family! This blog is written for informational purposes only. It is educational in nature and is not designed to be a recommendation for any specific investment product, strategy, plan-feature or other purposes. By receiving this communication you agree with the intended purpose described above. Any examples used in this material are generic, hypothetical and for illustration purposes only. None of Analyze Future, its affiliates or representatives is suggesting that the recipient or any other person take a specific course of action or any action at all. Communications such as this are not impartial and are provided in connection with the advertising and marketing of products and services. Prior to making any investment or financial decisions, an investor should seek individualized advice from a personal financial, legal, tax and other professional advisors that take into account all of the particular facts and circumstances of an investor’s own situation. Good post – people need to read more like this, because most info about this topic is generalized. You give real value to people. Anyhow, I’m definitely delighted I found it and I’ll be bookmarking and checking back often!